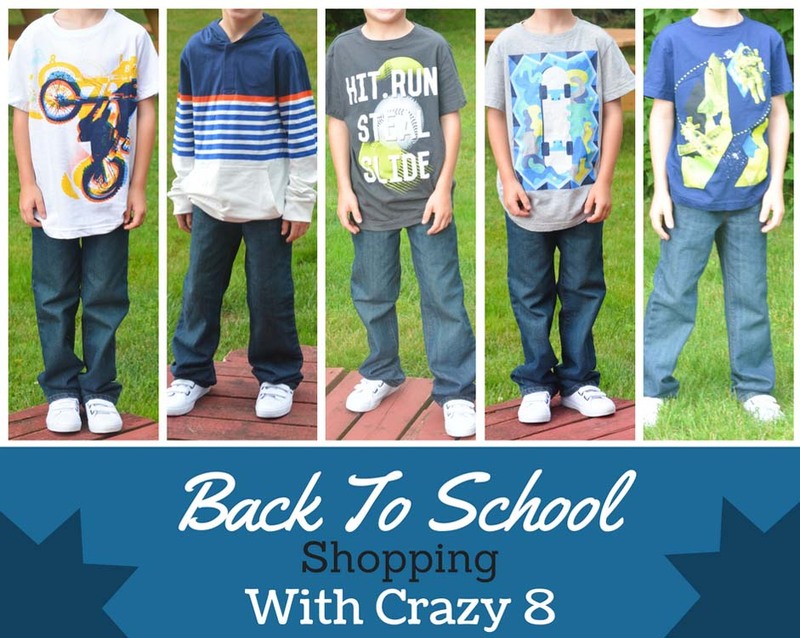 This back to school post is sponsored by Crazy 8. It’s hard to believe that in just a few short weeks the kids are heading back to school. I have mixed emotions as I love having them all around during the day but I’m ready to get back on a schedule and have a little quiet time around the house. I can remember how excited I used to get shopping for back to school clothes and new shoes. My older kids have a love/hate relationship with shopping, they enjoy the new outfits and new shoes, but they do not look forward to shopping in stores, they say I always take too long which I won’t dispute and prefer to sit down with me and look through the selection online. As a mom of three active boys I’m always on-the-go while scrambling to get everything in order at home. 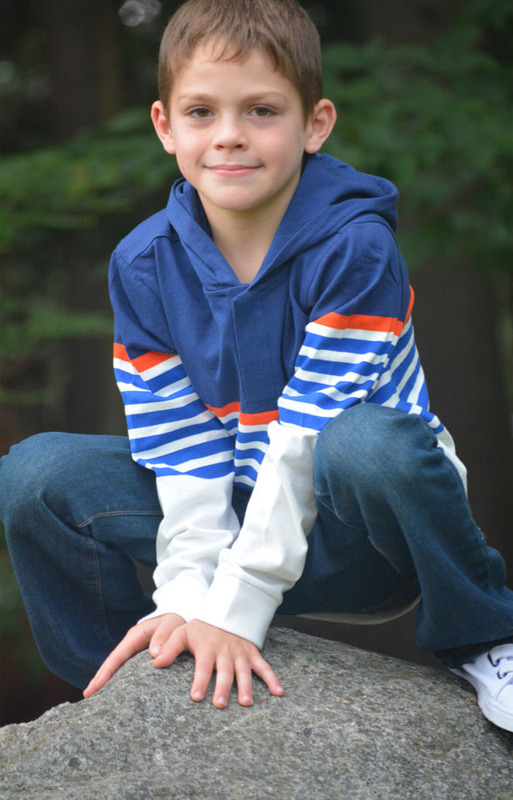 Crazy 8 knows that life gets crazy sometimes too, well maybe most of the time, so they make shopping easy and fun – parents get great deals on clothes and the kids love to wear them. WIN! WIN! 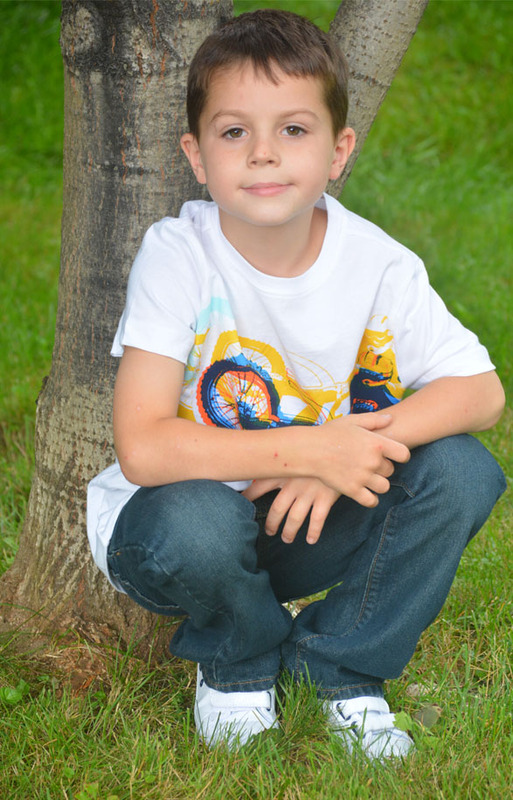 Even though my kids are almost 9 years apart, I can find clothes for my 9 1/2 year old as well as my 1 year old as they carry clothes for children 6 months to 14 years old. Every year demin is on our back to school list as it’s one of those must-have pieces in our wardrobe. Denim pants are the perfect for any back to school outfit and can be paired with a fun t-shirt and sneakers for playtime or they can be easily dressed up with a button down shirt and nicer shoes. Crazy 8 recently sent each of the boys a back to school outfit to head back to school in style. 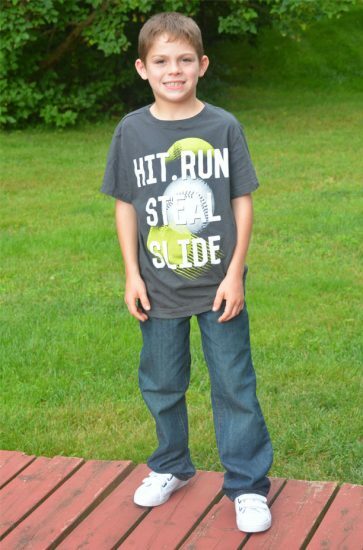 Jonathan and Trevor are both active and prefer the loose fitting or the boot cut style, allowing them to run around at recess and feel comfortable. 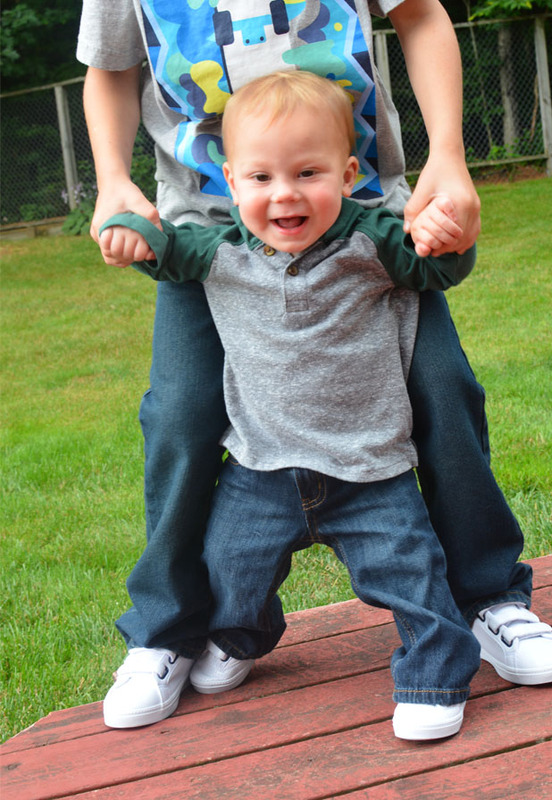 Crazy 8 denim jeans also have adjustable waists which are a must have with my thin boys. 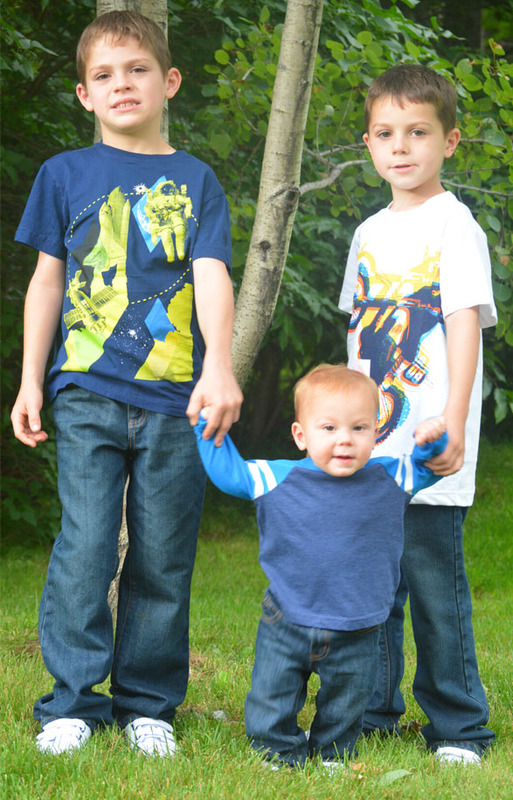 My go-to is the darker washes and I love that I can find size 12 months, 8s and 10s all in the same style and wash to match all three of my boys. No matter what shirt we pair them with, the denim always looks sharp. 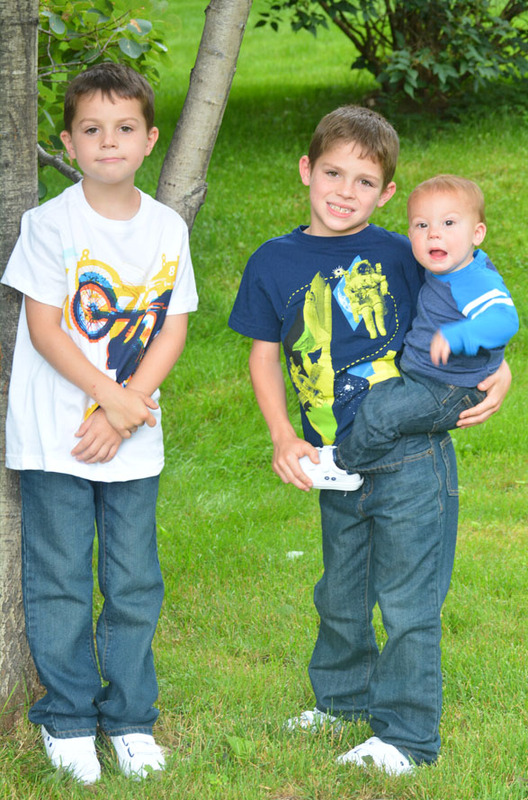 Since fall arrives early here in New England and with both boys about to outgrow their current sizes I went with the next size up so that their outfits would last them this school year. I love the look of the dark wash jeans with the white sneakers, we’re going to keep these shoes for nicer dress up days, as I’m sure they’ll get dirty in no time with the kids playing in the woods and running around. Look for sales – Right now all denim jeans are $9.99 at Crazy 8! Stop by the Marked Down Section – You can often find great deals during the end of the season clearance sales. Purchase clothing that is at least 1 size bigger for the next year. If one of the boys is in a 6 this spring, I’ll purchase a size 7 for the following spring. Sign up for Store Email Newsletters – most stores have an email newsletter that you can sign up to receive special sale alerts and coupons. Some also provide an instant coupon as soon as you sign up, while others may send them out within 24 hours. Set a budget – Teach kids the value of money, and how they can shop for sales to stretch their budget. 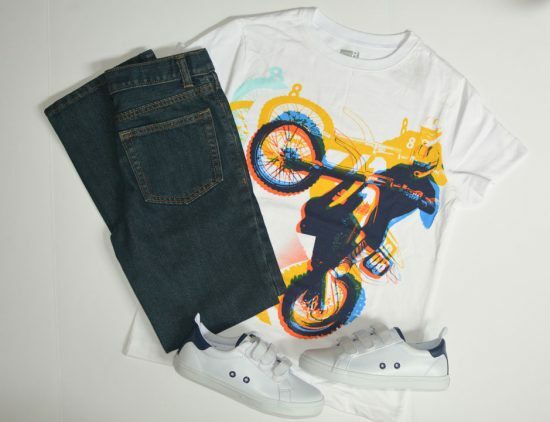 Check out Crazy8.com, what style will your kids be wearing the 1st day of class? $25 Crazy 8 Gift Card Giveaway! Stop by our Instagram to enter to win a $25 Crazy 8 gift card!